How do you follow-up one of the coolest environments you’ve ever produced? Well, you go ahead and produce one of the next most coolest environments of course! 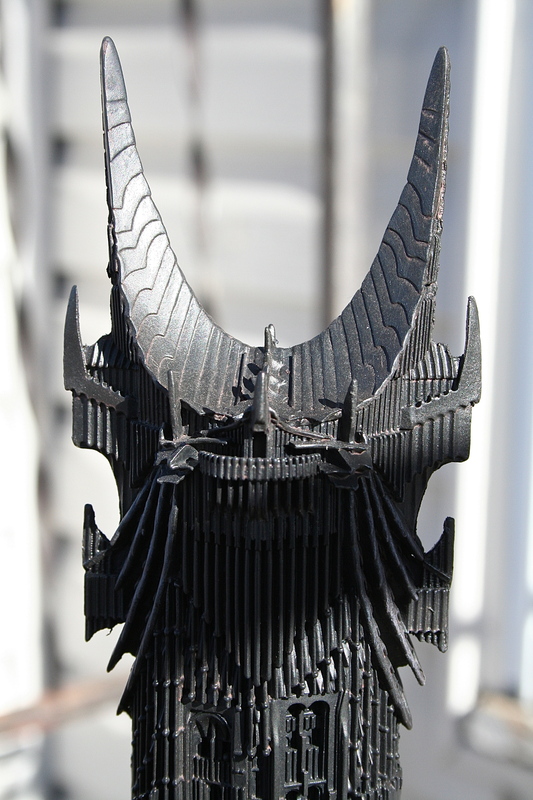 Shortly after Comic-Con 2011 senior model maker David Tremont began the momentous task of transforming the original model of Barad-Dûr for The Lord of the Rings into a collectible we could all own. Finally, after a year of slaving, fans of Middle-earth got to see the result at Comic-Con 2012 when Barad-Dûr was unveiled to the world. Sauron began work on Barad-Dûr during Middle-earth’s Second Age, when he chose Mordor as the place his dominion over Middle-earth would begin. Barad-Dûr was finished in the year 1600 of the Second Age and during that period Sauron would go on to create The One Ring, which would only help to make the fortress even stronger. During the War of the Last Alliance fortress was destroyed with the exception of the foundations as they could not be destroyed as long as The Ring was around. In 2951 of the Third Age Barad-Dûr’s reconstruction was started, but it would not last when Gollum fell into the lava of Mt. Doom destroying the Ring and the fortress. The graphics on the front of the box for Barad-Dûr have kept virtually the same design we’ve seen with previous environments from Weta. On the front of the box a screencap of Mordor with an image of Barad-Dûr completes the scene. Of course, you also have the beautiful The Lord of the Rings logo in the upper right-hand corner with the name of the environment under the picture of Barad-Dûr. One side of the box contains images of Barad-Dûr while the other side features images of other Weta Workshop products. The back of the box contains a great picture of the environment along with a background story about the collectible. Over 1,500 hours were put into Barad-Dûr to ensure the collectible on your shelf matches what you saw during The Lord of the Rings trilogy. I believe fans, once they have a chance to see the detail in this piece, will agree all of those hours paid off in spades. David Tremont and his team made very sure every window, spike, tower, ledge, bridge, and rock is included on this piece. Gazing upon this collectible, you can almost imagine Sauron or any number of his minions looking out upon Mordor from any of the many ledges and balconies. It truly is a great representation of the model we saw on film. What’s even more amazing is because of the material used it allowed these details to be captured and safely arrive to our homes. Rivendell had its beautiful river running through it and Barad-Dûr has something similar with its lava river flowing from Mt. Doom into the cavern surrounding the fortress. Even the rock areas of Barad-Dûr are exceptionally realized with the plains of Gorgoth looking like a place you don’t ever want to visit. Like Rivendell, this collectible is an achievement for Weta in showing off the amazing talent of their artists. 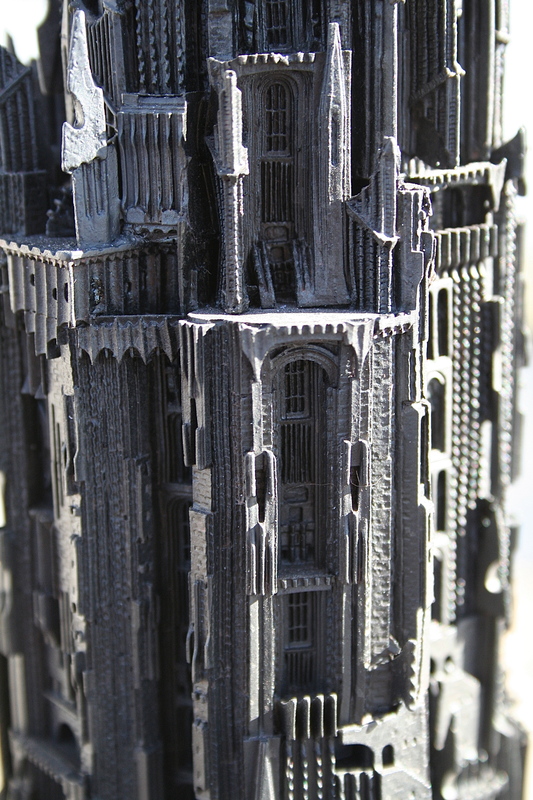 The paintwork on Barad-Dûr is fairly simple compared to say Rivendell, and much more in-line with that of Orthanc. It’s all black and the shading for the different levels in different places are all really well done. The color of the tower does not match the color of the rock within the piece. That was going to be the toughest part of the paint I think and they were able to create the proper level of separation. The lava looks really good and stands out like lava would with an all-black world of Mordor. 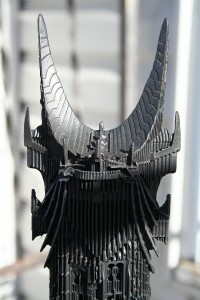 Barad-Dûr costs $700 but the level of detail you get and the size of this piece allows you to truly get value for money. This piece is a limited edition piece with only 1,000 of the fortress being produced. Barad-Dûr does not come with a flaming eye but if that is a potential issue for you all you have to do is download the iPhone or iPad app. Then you will have the eye of Sauron. Finally, I cannot implore you enough if you are a The Lord of the Rings collector to find a way to get this piece into your collection. Also, if you’re truly interested in what it took to bring this collectible to life check out the three articles by David Tremont. In these articles he explains the ups and downs of making sure we got one of the best environments ever created. 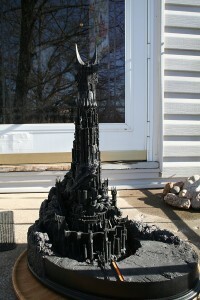 Barad-Dûr is limited to 1000 pieces world-wide.